Posted April 19, 2018 by Erin Sherwood. That old adage, “Do as I say and not as I do” doesn’t work on wayward teenagers, and it’s equally as ineffective in your workplace. Employee engagement begins at the executive level and trickles down through members of management. If the upper echelon is not committed to the cause, don’t expect hourly employees to take up the torch. 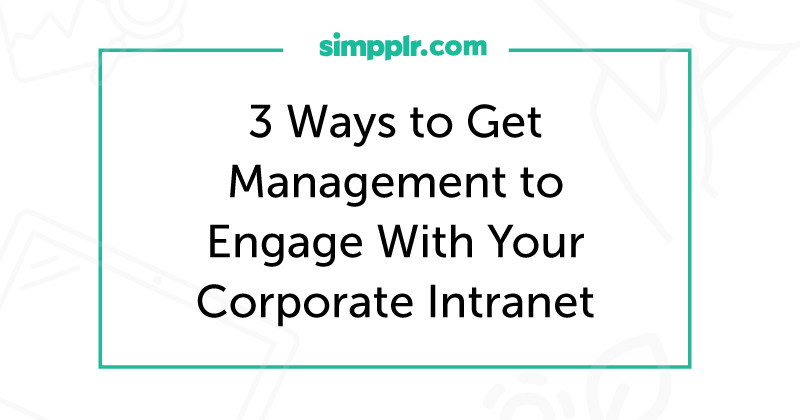 If you’re struggling to groom a management staff that leads by example, that regularly encourages employees to become involved and engaged, try these innovative methods that utilize a resource already in place — your corporate intranet. Regularly scheduled updates that generate at the top level are always an attraction, but once the conversation becomes two-way, employee engagement skyrockets. Something so simple as adding an intranet link to an Ask-the-CEO feature could raise employee morale and provide valuable feedback for executives from the hourly level. Adding this feature, however, is useless if employees aren’t aware of its presence or if they can’t find the time to interact with it. This is where your management team can take the lead by encouraging employees to visit the link regularly and by giving them enough time to do it. This one may seem like a no-brainer, but sharing news that impacts the company is an effective way to keep employees in the loop and engaged. Share the big stuff like company acquisitions, change-over at executive level and stock prices, but don’t overlook the local front when somebody in the office has a baby, celebrates a birthday or retires. Event calendars are perfect magnets for attracting workers to the corporate intranet when you add entries for in-house parties, pot-lucks and life-status changes. Get your management staff involved by encouraging them to gather the necessary information each month and post it on the site. Offering a dedicated space for employees from each department to find information, interact with one another and collaborate on projects is another way to personalize engagement. Make the conversation two-way by allowing comments on posts and by creating a social feed for employee communication. Assign each member of your management team a department to head up and make regular, online interaction mandatory. In conclusion, as a company, you’ll get out of your management staff the same amount of communication and interaction that you, yourself, model. If you want active, mutually beneficial discussions to happen, you must take the initiative and provide the platform for such talks to take place. You must also be willing to be the first to reach out. Your corporate intranet provides all the tools you need to do it. Learn how developing a high-level digital workplace strategy can allow your organization to start taking full advantage of the connection between employee engagement and customer satisfaction.